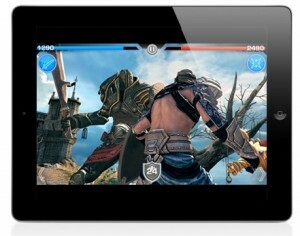 “The iPad is not an iPhone,” said Graeme Devine during a conference session at this week’s Game Developers Conference (GDC) in San Francisco. It may seem obvious to some, but Devine thinks it’s important to underscore for game developers who are creating titles for Apple’s tablet. Devine’s reputation is legendary. He co-founded game maker Trilobyte and created titles like The 7th Guest and The 11th Hour, ghost story adventure puzzle games. Later he joined Id Software and worked on Quake III Arena. Devine even did a stint at Apple, working on iPhone games in 2009 and 2010. He’s since returned to independent game development, starting GRL Games in late 2010 to bring games to iOS and Mac OS X. This isn’t a mistake that rookie game developers make – even seasoned, large iOS developers have dropped into the unfortunate habit of simply scaling up the graphics in their games but leaving interface and other game elements untouched – and from Devine’s perspective, this is a huge mistake. Another mistake Devine has seen is in porting games from the desktop to the iPad. “It’s not as easy as it first appears to be,” he said. Devine pointed to Apple’s own iWork apps for iPad as an example how to do it right. “It’s very easy to have a dozen bad ideas right away,” said Devine. But in the case of iWork apps, Apple has retooled them to take advantage of the iPad’s touch-based interface. Devine observes that users utilize a different part of their brain to activate actions on the iPad by swiping their fingers across the screen, rather than pointing and clicking. Devine highlighted some games and software toys for the iPad that he thinks have really gotten the mix right. Let’s Create Pottery HD is a particular favorite of the Devine family, he said – it’s an entertainment title that lets you spin a pottery wheel, and it makes innovative use of the iPad’s accelerometer. “Playtest as quickly as possible,” said Devine. It’s important for developers to make apps playable within a couple of days and get it into tester’s hands to find out what works and what doesn’t. “Consider the overall app experience,” Devine opined. Make sure to offer a robust game-saving feature, since iOS gamers tend to play quickly in short bursts of a few minutes, and make sure the app launches quickly.